THE STONY POINT BAPTIST CHURCH. FIVE YEARS LATER A. J. REPLACED BY A SMALLER STRUCTURE DEDICATED IN 1938. THE EARLIEST GRAVE IN THE CEMETERY, THAT OF W. M.
TRANSFERRED TO THE STONY POINT CEMETERY ASSOCIATION. BAPTIST CHURCH HAD A DRAMATIC IMPACT ON THE REGION. AND FOR THE ANNUAL DECORATION DAY SERVICES. The community here was called Stony Point. In the 1870's and 80's Stony Point was a thriving community with a cotton gin, a general store, a molasses mill, a grist mill, a church and a school. The first school was called the Johnson School. The name "Chambliss" is also applies to the area. It was actually a little northeast of the church and cemetery. The Stony Point Baptist Church of Christ was organized in 1878. Out of the Stony Point Baptist Church were started the Altoga Baptist Church, Valdasta Baptist Church and White Rock Baptist Church. I believe that all of these churches still exist. 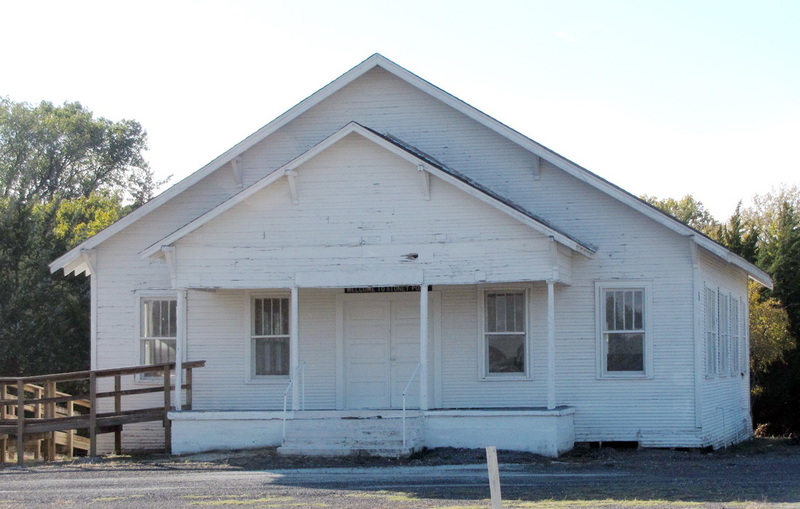 The Stony Point Church is no longer in use except for funerals or special occasions. The Stony Point Baptist Church shares a historical marker with the Stony Point Cemetery.